Watch as the springed wings on this elegant Red Glass Butterfly Plant Stake gently bounce in the breeze simulating flight! Beautifully hand painted in vibrant colors and adorned with glass beads, these stakes are sure to charm and delight. 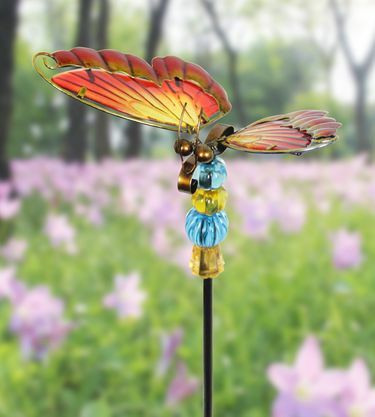 Made of metal and glass, these buterfly stakes take our classic WindyWings design to a whole new level making and endearing addition to your garden! Size: 6.5" x 6" x 30" H.